The first time 17-year-old Kerry visits the island, he’s with his family. Like always. But he dreams of returning, living, on his own. So, when an old family friend invites him to stay for the following summer, he jumps at the offer. He arrives and quickly has a job at the market, delivering groceries to the locals. He meets Phoebe, a seven-year-old girl with a troubled past, and Phoebe’s eighteen-year-old nanny, Mary, on one of his delivery trips. What starts as a casual friendliness, quickly evolves into a meaningful relationship between himself and Phoebe, and even more surprisingly, Kerry finds himself drawn to Mary in a way he’s never experienced before. 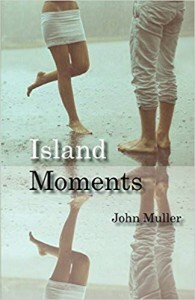 Set in the late 60s, Island Moments is a story about growing up among the stillness, surrendering to the moments we experience from day to day, and cherishing the people we meet, even at the most inopportune times.